In the ongoing DVD rental market tussle between the studios and the rental companies, Netflix have followed Redbox in snubbing the Disney Studio four week rental delay policy. How long will Netflix subscribers have to wait for Disney DVD's? Although Netflix already have agreed to the window with studios, Fox, Universal and Warner, it seems that Disney wanted better terms than its competition according to sources close to the deal. 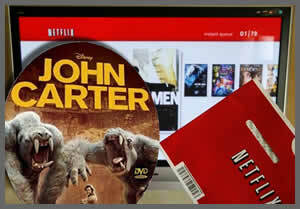 So just like Redbox, Netflix are circumnavigating the new rule by buying Disney DVD releases such as recent ‘flop’, John Carter from alternative sources (retailers instead of the studios).